Hiking in Jasper National Park is one of the best ways to experience the beauty of the Canadian Rockies. And if you’re new to hiking, don’t fret: from easy paths to rocky summit scrambles, there are plenty of hikes in Jasper that you can tackle no matter your skill level. Take it from me – I was a total hiking idiot newbie when I moved to Calgary for a 6-month work project. Every weekend, I’d rent a car and drive out to Banff, Jasper, Canmore, and Waterton Lakes to explore the incredible trails and breathtaking landscapes in the area. Needless to say, I got totally hooked on hiking in the Canadian Rockies. By the end of my time in Calgary, I went hiking literally every weekend. In this post, I hope to help YOU get excited about hiking in this incredible region, too! To help you plan (and get you FREAKING EXCITED about visiting the most beautiful place on earth), I’ve compiled this comprehensive list of 15 Jasper hiking trails to add to your Canadian Rockies itinerary. To help you choose the right hikes in Jasper for your skill level, we’ve organized this post into sections: Easy, Moderate, Challenging, and Multi-Day. Within each section, there are hikes of various lengths and trail types that you can explore and try! Formed over thousands of years from glacier activity and runoff, Maligne Canyon is home to the deepest and most epic gorge in the entire Canadian Rockies. Arguably one of the coolest and most beautiful hikes in Jasper, hikers of all levels can enjoy a walk through the canyon’s easy trail system. The trail starts off at the parking lot for Maligne Canyon, and branches off in a bunch of different directions. If you have a lot of time, it’s worth simply wandering around them, admiring the rushing Maligne River and the incredibly dramatic canyons. For people who are a bit more time-strapped, it’s best to take the trail to the left in order to get to the canyons (the best part of the hike, IMO) the fastest. In the high season, this trail can get very crowded, so be sure to come early if you’re hoping to avoid the crowds. However, in the winter, the canyon freezes to reveal some pretty epic frozen waterfall formations. For more detailed hiking information and trail guidelines for Maligne Canyon, check out this handy guide. As the shortest hike on our list, the Pyramid Island Loop is a short circuit around a cute, tiny forested island in the middle of Pyramid Lake. Better for the pretty views than for actual exercise, the Pyramid Island Loop trail is an easy trail that’s perfect for beginner hikers or families. Upon entering the trail, you’ll cross a long, wooden bridge (that’s super picturesque) before arriving at Pyramid Island. Once you arrive on the island, you can take the trails around the perimeter, watching squirrels racing around and listening to the breeze rustling through the evergreen trees. Even on foggy days, it’s worth coming to this trail because the fog gives the island a spooky, eerie look that’s pretty freaking awesome. Plus, if the weather gets rainy or bad, you can easily hightail it back to your car in less than 10 minutes. Although it’s not the tallest waterfall in Jasper National Park, Athabasca Falls sure is a mighty one. Set on the Athabasca River with Mount Kerkeslin looming in the background, this short, easy trail is a perfect one for hikers of all experience levels. You can wander down this flat trail for a while, admiring the many viewpoints of the river, the surrounding peaks, and the forests surrounding the hiking area. From the trail, you can see views of Brussels Peak and the Watchtower. Photographs don’t really do Athabasca Falls justice – you have to witness it in person to understand its incredible power and strength. 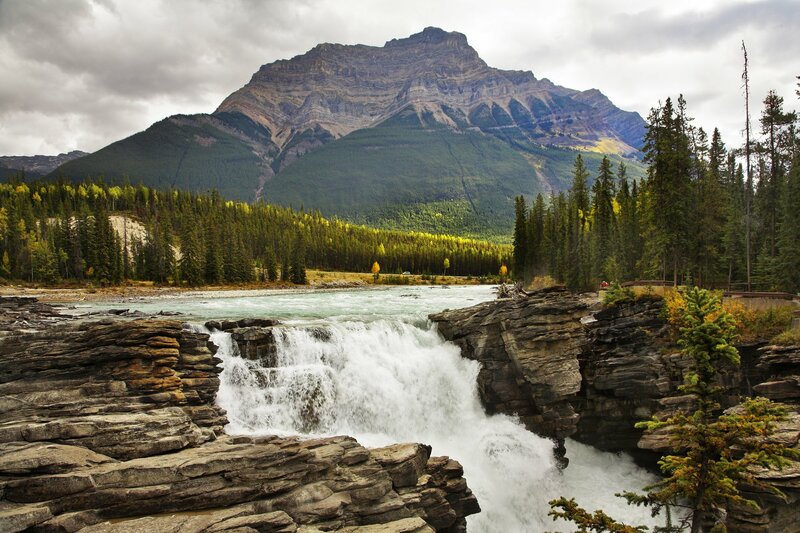 For more detailed information about the Athabasca Falls hike, check out this helpful guide. One of my all-time favorite places to go hiking in Jasper National Park is the Valley of the Five Lakes. 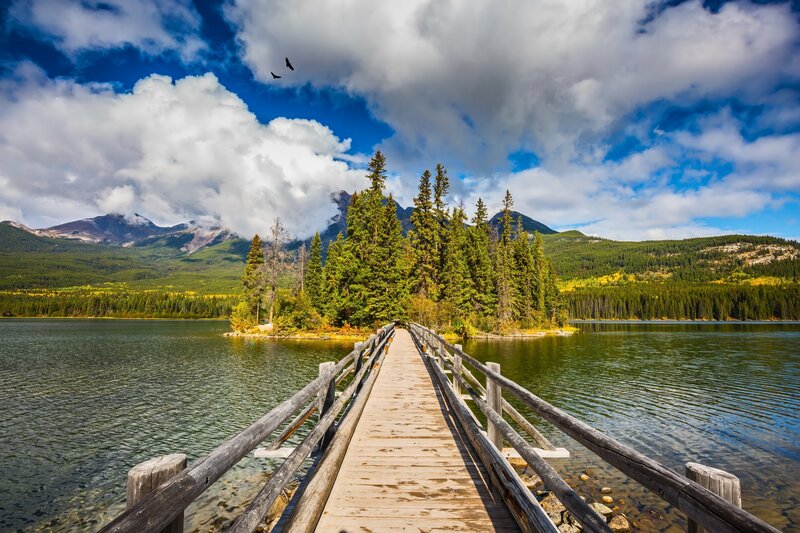 The magic of this trail is exactly what it sounds like: five gorgeous, picturesque lakes with the Canadian Rockies in the background. What makes this easy trail special, in my opinion, is the fact that it’s a little bit longer than most of the other easy trails in the park. It’s perfect for beginners wanting a half-day adventure on one of the most tranquil and iconic Jasper hiking trails. The trail is shared by lots of visitors as well as mountain bikers, so if you prefer a quieter walk, aim to get there early in the morning. 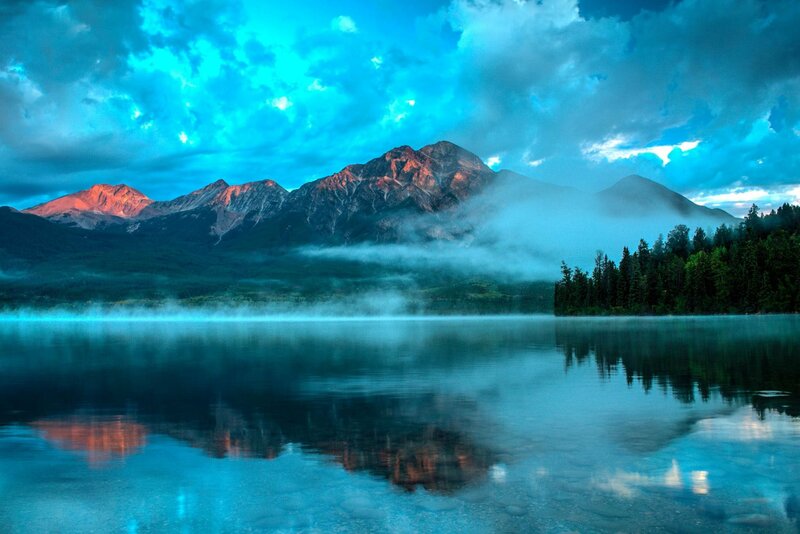 Plus, the lakes are typically calmer at this time and offer serene and stunning views. For more detailed information on the Valley of the Five Lakes hiking trail, read this awesome guide by Travel Yes Please. 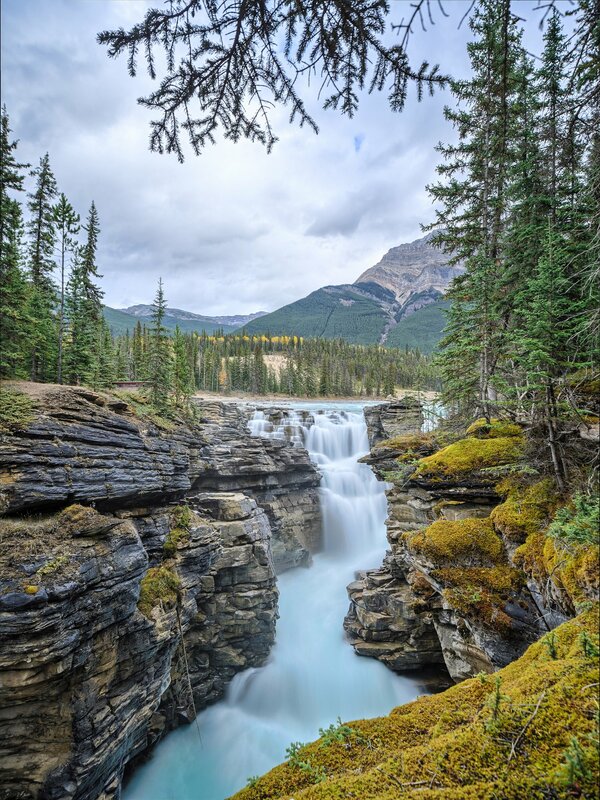 The Sunwapta Falls trail is another easy, popular waterfall hiking trail in Jasper. 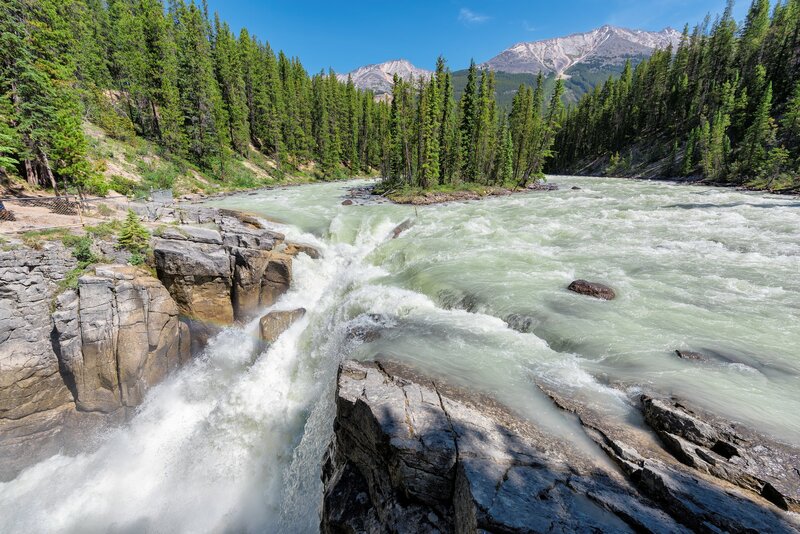 Here, you can hike to both the central and Lower Sunwapta Falls, which offers a gorgeous view of the powerful falls through the evergreen trees. Pro tip: Don’t stop when you get to the main Sunwapta Falls! It’s not the end yet! There’s another waterfall farther down the trail called the Lower Sunwapta Falls. I have literally no idea why the falls have almost exactly the same name, but they are, in fact, two separate waterfalls on the same trail. In my opinion, the Lower Sunwapta Falls are more beautiful than the main ones, so DON’T MISS OUT on them! Hikers who want a bit more of a challenge (without anything too technical) will enjoy these moderately difficult hikes to some pretty fantastic lookouts in Jasper. On the way to Jasper from Banff or Calgary, you’ll take the Icefields Parkway. And while you’re driving on the parkway and wanting to stop for some fresh air, the Wilcox Pass is the perfect half-day hike to enjoy the views. 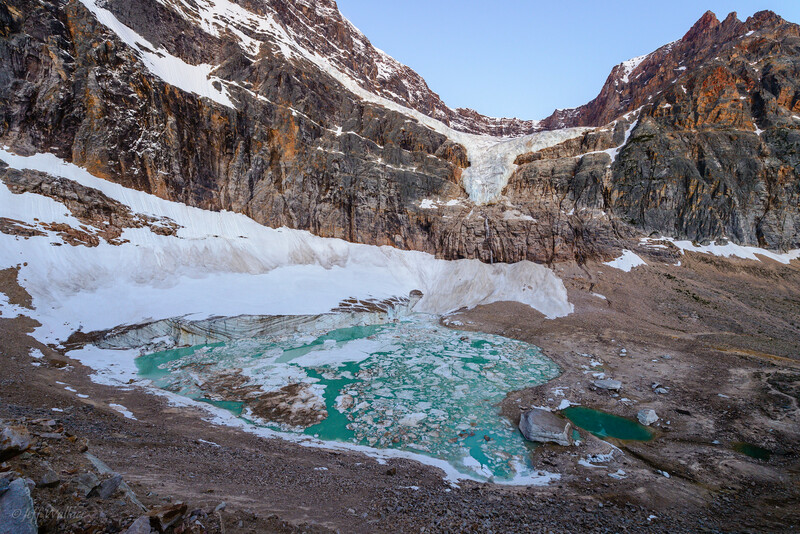 This moderately difficult trail begins right off the Icefields Parkway and ascends up into alpine meadows, with amazing views of the vast Athabasca Glacier. Along the way, you’ll pass the iconic red chairs (pictured above). Definitely stop if you’re out of breath and ready for a break with a view. Pro tip: It gets reallllly windy as you move up in altitude, especially since the trail begins at a high elevation. Be sure to protect your valuables and bring a windbreaker jacket for the higher altitudes. For more detailed instructions and information on the Wilcox Pass hike, check out this guide by Trails Unblazed. Highlights: Amazing views of Angel Glacier! Edith Cavell Meadows is one of the most popular trails in Jasper, and for good reason – it’s got a bit of everything, from mountain views to alpine meadows to hanging glaciers and more. The first part of the path is paved, leading you to a lookout point over Angel Glacier. It’s a really nice spot to admire the view and hang out for a bit before continuing onwards and upwards. When I was there, there was a lovely older lady painting a canvas of the landscape, which was really nice to watch. After the lookout point, continue up the ascending trail, which will bring you past some nice forests and meadow areas. The path leads to two more viewpoints – most people (myself included) choose to stop at the second one, but there’s the option to continue up a ridiculously steep trail to the third. 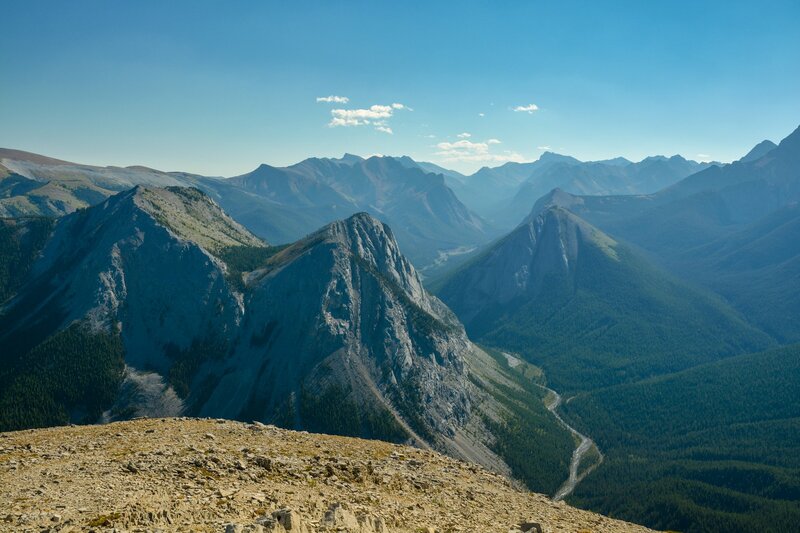 Known among locals and hiking geeks as one of the best hikes in Jasper, Opal Hills is a moderately difficult, popular trail that leads up to some seriously gorgeous views. Weaving through alpine meadows, steep inclines, and a few different lookout points, it’s a varied and unique hike that’s definitely worth a half day! The trail varies from almost flat to VERY steep, so be prepared to do some climbing. However, the breathtaking views are absolutely worth the huffing and puffing it takes to get to the top. This website recommends doing the trail counter-clockwise. Do this hike in the spring and early summer, when the wildflowers are in full bloom. The meadows come to life with all kinds of different colors, and it’s truly a magical experience. For hikers who want a bit more of a challenge in Jasper, these hikes are an awesome way to explore the area. Rock scrambles, steep ascents, and scree fields in many of these hikes lead to some of the most rewarding views in the entire park. Sulphur Skyline is a half-day, fairly challenging summit hike that gives you access to some of the most jaw-dropping views of the entire park. Of all of the hikes in Jasper you can do, this one comes highly recommended by almost everyone who has done it. The trail begins at the Miette Hot Springs parking lot, near the heated pool area and begins with a steep ascent, which leads you up the mountain throughout the entire hike through the summit. At the top, on clear days, you can see spectacular views of the Canadian Rockies and the valleys below. It’s truly one of the most amazing views in Jasper and well worth the tough hike up. Afterward, you can stop by the Miette Hot Springs for a relaxing dip in the warm pool, which is especially nice after you scaled a mountain and your muscles are sore AF. For more information on the Sulphur Skyline hike, read a more in-depth report on this post by The Anthrotorian. Verdant Pass is one of the most challenging hiking trails in Jasper, but also one of the most rewarding, with a trail that winds through alpine meadows and up to a jaw-dropping mountain pass. Verdant Pass is an awesome hike to pair with a trip to Edith Cavell Meadows (mentioned above) and the surrounding areas. This hike is rated as a “challenging” hike for a variety of different reasons: it’s a long trail that takes a full day, the inclines are steep, AND the trails are less obvious and difficult to navigate. Therefore, we recommend tackling this one ONLY if you are an experienced hiker. As this is an out-and-back hike, many people choose to turn back once the trails become a bit more dicey. For more detailed hiking instructions and information, head over to this Verdant Pass guide by 10 Adventures. 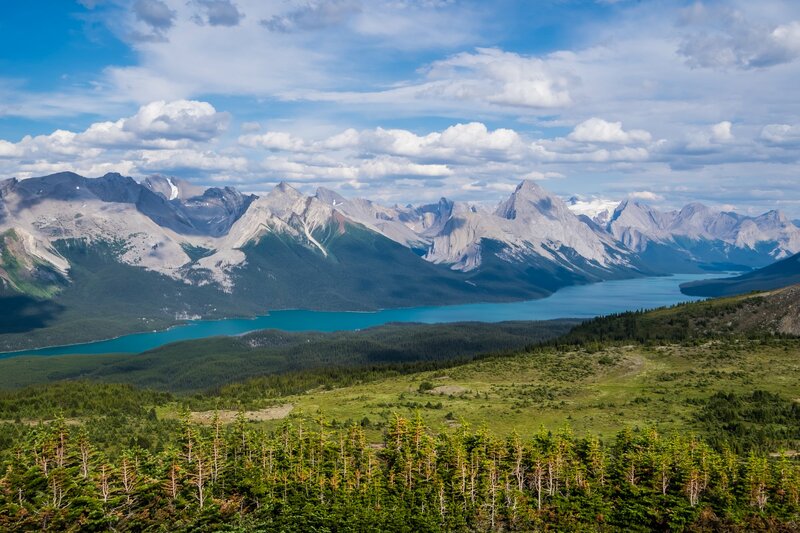 As one of the most popular full-day Jasper hikes, Bald Hills is an amazing and challenging trail that will bring you up to some of those drop-dead gorgeous views you see in the postcards. This summit hike is one of the best hikes you can do in the park, and we highly recommend it if you’re up for the challenge. The trail consists of fairly steep uphills interjected by alpine meadows. Eventually, the trail will split for the “loop” portion and you can get to the summit either way (though I’d recommend taking the left path as it’s a bit shorter than the right). Once you’re done with the hike, you can hang out, decompress, and grab some snacks in the Maligne Lake area, which is heavily trafficked during high season. Highlights: Amazing views from the summit bordering the tramway! This full day hike isn’t for the faint of heart, as it’s a full day of steep uphill trails. But, for the views (and the hiking experience), the trail is totally worth it! There are two ways to do this hike: the long and challenging version, or the short and sweet version. But first, the long version: Starting from the base of the mountain, you’ll hike through forests and above the tree line for ~2.5-3 hours. Then, you’ll pass by the gondola platform (more on this below), and head up for 30-45 more minutes to the summit. Aaaand, the shorter version: The “lazy” way to do this trail is to take the Whistlers Mountain Gondola to the platform, then hike from there. It should take less than one hour each way from the platform to the summit. It’s arguably one of the easiest summit hikes in Jasper if you do it from the platform! For a hike extension with more peace and quiet, head further onward on the trail to Indian Ridge. One of the best ways to fully challenge and immerse yourself in the humbling nature of Jasper is to do a multi-day hiking and backpacking trip. Personally, I haven’t done any multi-day/backcountry hiking in Jasper, BUT it’s super high on my list for next time! I’ve included these options so you know about them and can plan your trip accordingly if you’re interested in trying them. Highlights: Amazing backcountry hiking and camping opportunities, beautiful views, immersion in Jasper’s incredible nature…the whole shabang, basically. The Skyline Trail is known as one of the most amazing backcountry trails in all of the Canadian Rockies. Here, you can get some of the most marvelous views of the Canadian Rockies, while also catching a glimpse at the power and beauty of raw, wild nature here. In other words, this hike is very high on my list of Jasper hiking trails to tackle next time, and if you’re an experienced hiker, you should consider it too. Spanning nearly 50 kilometers through some amazing mountain passes, adventurous hikers typically complete this trek in 3-4 days (but sometimes less). Of course, you have to hike with all of your gear, which may slow you down a little bit in terms of distance and speed. 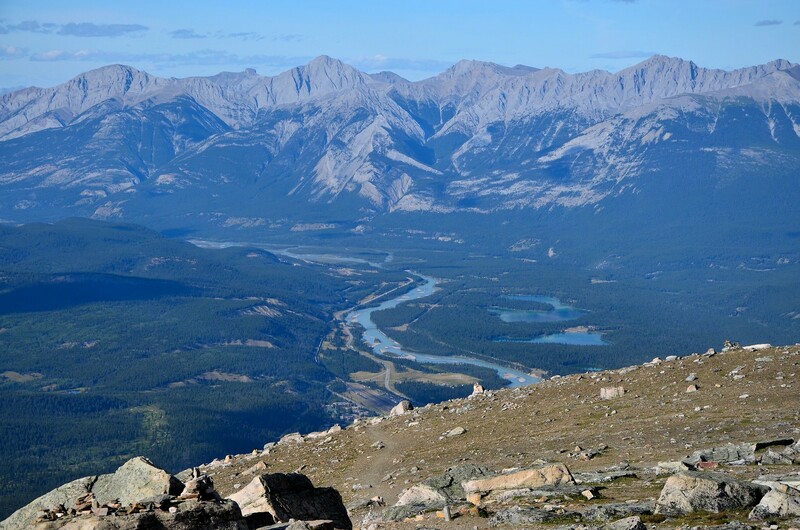 If you’re interested in tackling the Skyline Trail on your next trip to Jasper, read this fabulous guide by Clever Hiker first! It’s really important to be prepared and to know what you’re getting yourself into before embarking on a backcountry trek. Pyramid Mountain is one of the most iconic peaks in all of Jasper, and with some planning, you can actually hike to its summit! This long full-day/multi-day hike is perfect for experienced hikers who want to bag a summit in Jasper without too much technical stuff. There is a bit of scrambling involved to the top, but it’s interspersed with walking trails and rest opportunities. While there are people who have completed this ~20 mile hike in one day, if you’re going completely by foot, we’d recommend going a bit more slowly and spreading the trail out over the course of 2 days. You can take an overnight backcountry camping night in between. You can also bring a bike and shorten/facilitate the trails by riding up to the old gondola and parking there. For more information, check out this guide by Explore Jasper. 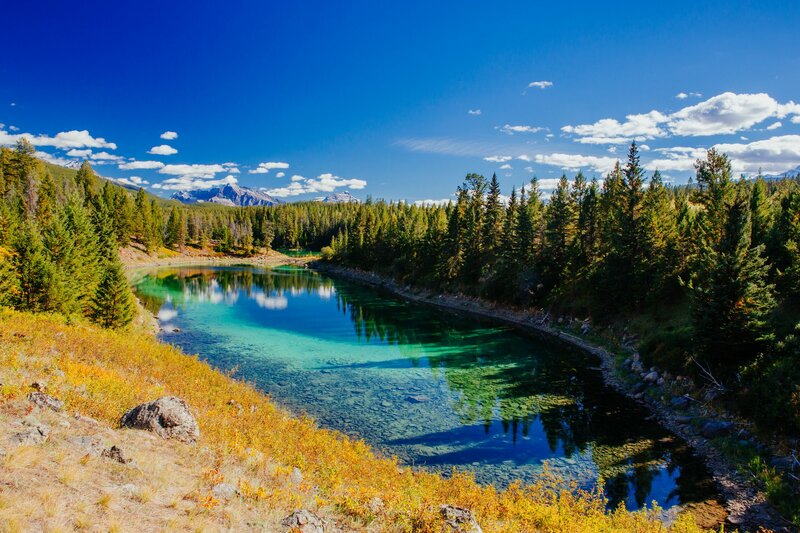 A trail that passes by several beautiful lakes, forests, and viewpoints, the Tonquin Valley trail is arguably one of the best hikes in Jasper (if not the entire Canadian Rockies area…). This is the #1 backcountry hike on my list for my next trip to Jasper – it seems like an absolutely epic way to spend a few days in the park. On this multi-day hike, you’ll weave through the Tonquin Valley, stopping and camping in the midst of some of the most advantageous places in the entire park for photography and sunrises. There are designated campsites in really spectacular locations; some of the best in all of Alberta, to be honest. Because this is one of the less-frequented hikes in the park (due to its length and difficulty), you may only be sharing your campsites/views with a handful of other people. To help you get a sense for the specifics of the Tonquin Valley Trail, head to the official Parks Canada guide. Jasper is a year round destination! While most people flock to Jasper in July and August, there are things to do here all year. In the summer, there are hiking and camping opportunities (like this ones in this post), while in the winter, there are amazing places to try skiing and snow sports. Wildlife is rampant in Jasper. Chances are, if you’re in Jasper for any significant amount of time, you’ll run into some wildlife. We’re talking anything from chipmunks to grizzly bears. When hiking, always bring bear spray with you and walk with a buddy or a group to protect yourself. And, of course, DO NOT FEED OR APPROACH ANY WILDLIFE. EVER. There can be ice and snow on the trails year round. Just because the weather is nice outside does not mean that the trails are free and clear of ice. Check the weather forecast and the trail conditions on Parks Canada’s website before embarking on any hikes. Jasper is fairly remote, but it’s not hard to get to. Well-maintained highways across Alberta lead directly to Jasper from many other attractions in the area. To make traveling and hiking in Jasper easier, I strongly recommend renting a car in Calgary, Banff, or Edmonton – getting to the individual trail heads and around the park can be a logistical nightmare without one. From Banff: Beginning in Banff National Park, take the Trans-Canada Highway toward Vancouver. Then, exit onto the Icefields Parkway near Lake Louise. From there, drive 2-3 hours (or more, if you make stops) until you reach Jasper. Don’t forget to make a few stops and look around – the Icefields Parkway is one of the most beautiful drives in the entire country of Canada! From Calgary: Starting in Calgary, take the Trans-Canada Highway toward Vancouver, then exit onto the Icefields Parkway near Lake Louise. After that, it’s a 2-3 hour drive (plus more time if you make stops). From Edmonton: Take Yellowhead Highway/AB-16 towards Jasper, which will take you directly to the park. The drive from Edmonton should take 3-4 hours. It’s worth spending a few days in Jasper rather than taking a day trip from Banff. While there aren’t as many options for places to stay in Jasper as in its southern counterpart, there are still fabulous accommodations for travelers at any comfort and budget level. While there are a few luxury resorts and hotels in Jasper, the best, by far, is the Fairmont Jasper Park Lodge. Like its Fairmont counterparts in Banff and Lake Louise, the Fairmont Jasper Park Lodge is full of beautiful decor, high-end rooms, fine dining, and plenty of amazing views. For travelers who enjoy a bit of luxury and comfort, this hotel is a perfect fit. Click here to check reviews and compare prices for the Fairmont Jasper Park Lodge. For budget-conscious travelers who still want the amenities of a full-service hotel, the Chateau Jasper Hotel is a fantastic option. It’s a clean and well-run lodge (with an attached restaurant) that offers a perfect base for exploring the rest of the park. Click here to check reviews and compare prices for the Chateau Jasper Hotel. Budget travelers looking for a comfortable place to stay in Jasper should definitely check out the Jasper Downtown Hostel. Located in the middle of town, the hostel has easy access to grocery stores and restaurants. Click here to check reviews and compare prices for Jasper Downtown Hostel. For large groups or families, a vacation rental is probably the most cost-effective Jasper accommodation option. Many of the cabins in the area are incredibly spacious and can sleep 4+ people. I recommend checking Airbnb or VRBO for vacation rental listings and availability. (If you click this Airbnb link, you can get $40 off your first booking on the platform!). 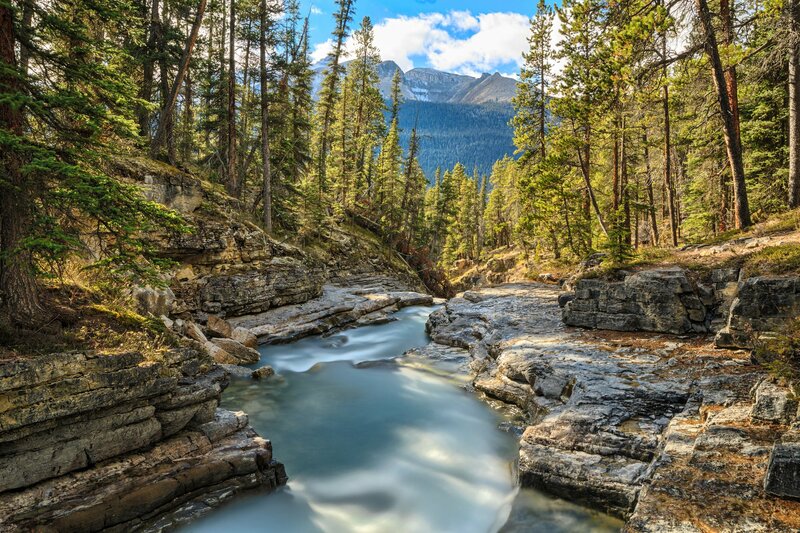 For outdoor enthusiasts who want to truly immerse themselves in nature while hiking in Jasper, there are plenty of front- and backcountry camping options in Jasper. Did you find this guide to hikes in Jasper useful? Be sure to bookmark it or pin it for later!